I'm on a mission to add more side dishes to my recipe index (the one on the right, with the drop down menus) this summer. 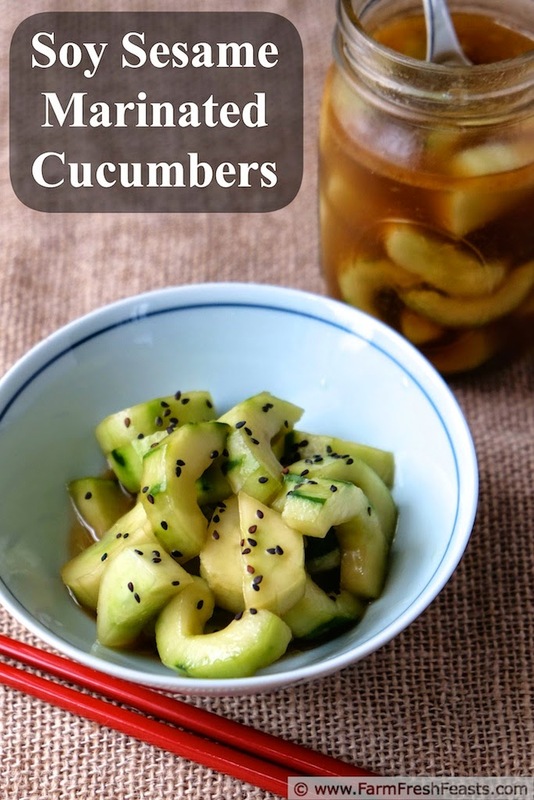 While I have included cucumbers in a host of recipes (see the Visual Recipe Index) I didn't have a stand alone cucumber recipe until this one. I don't grow cucumbers, but in addition to the cukes from our Community Supported Agriculture (CSA) farm share I'm fortunate to work with generous gardeners who share their bounty. When I was at work last week I picked up a few beauties--then I needed to find a use for them! While I was thumbing through The Party Party Party Cookbook put out by the Potomac Curling Club (for my Fritter recipe), I saw a recipe for Jim Macpherson's Cucumber Salad. The flavors looked like something my family would like, so I whipped up a batch. Good! Then I tweaked the recipe a little but (cutting the Tabasco, swapping honey for sugar, and finishing with a garnish of sesame seeds) and decided it was blog-worthy. I brought this to a picnic last week. The entree was catered by a BBQ place. 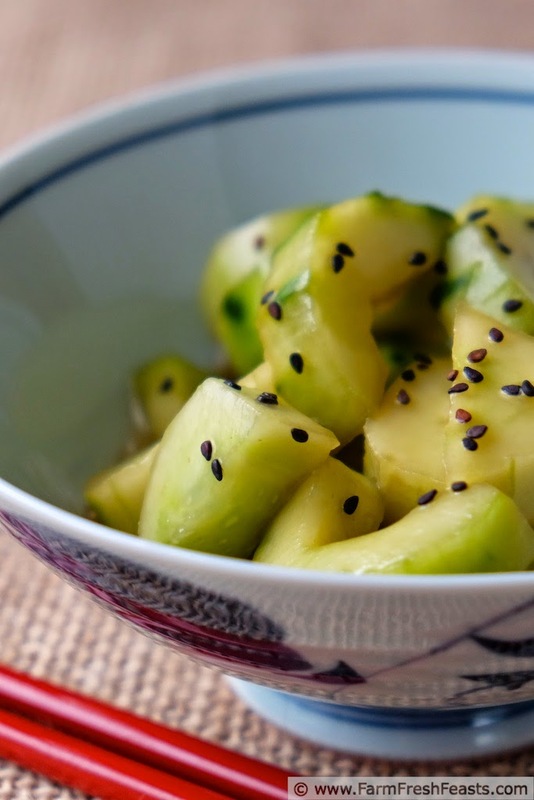 These cool, crunchy cucumbers fit in nicely with the usual sides. 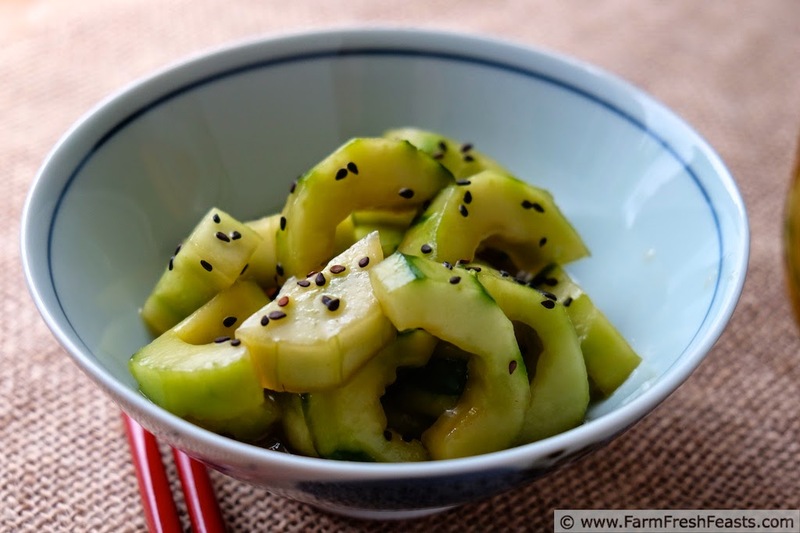 They were easy to transport--I just brought the marinated cucumbers in a mason jar, dumped it into a bowl, then added the sesame seeds. 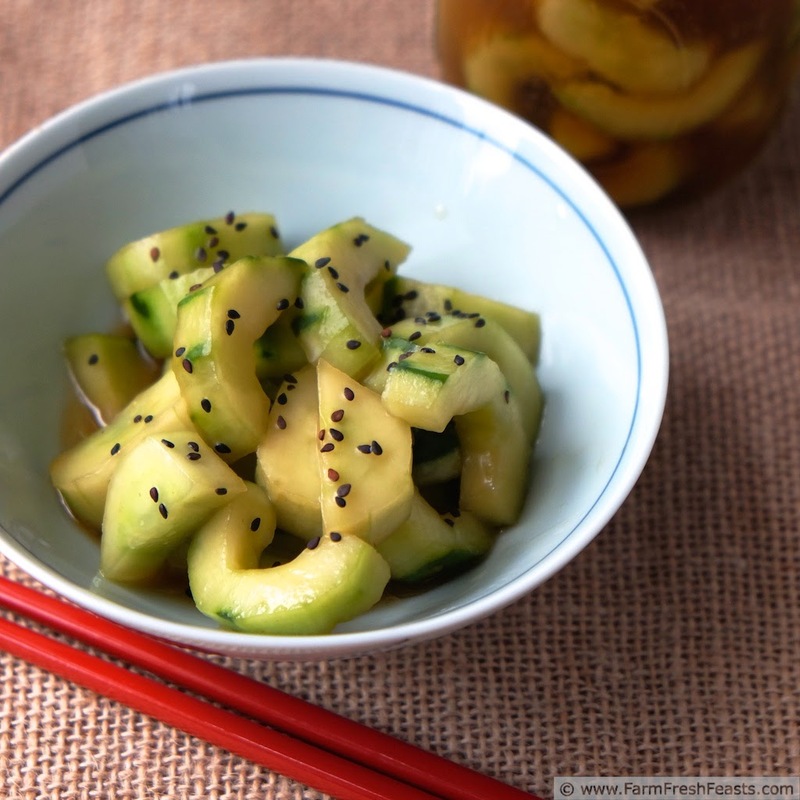 NOTE: The marinade for these cucumbers keeps a few days, and can be reused. I made multiple 2 cucumber batches using the same batch. After a day the cucumbers get softer, but are still flavorful. I recommend keeping the mixed up marinade and adding fresh cucumbers a few hours before you wish to serve. In a large bowl, whisk first 6 ingredients until combined. Add cucumbers, and mix until coated. Chill for at least 2 hours. 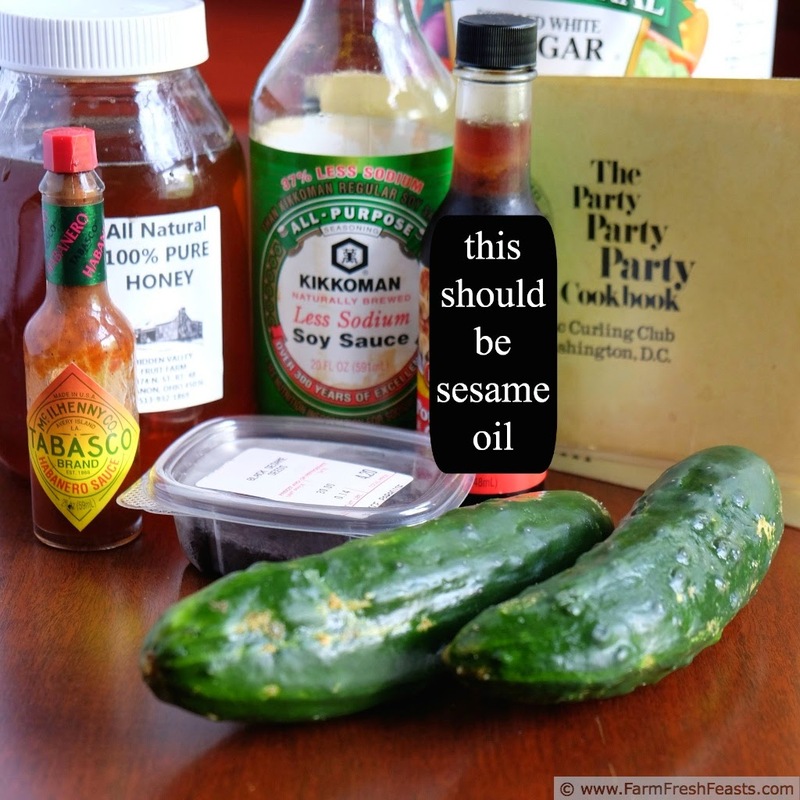 Before serving, remove from marinade (can be saved in a jar, see NOTE above) and sprinkle with dark sesame seeds. Any excuse to eat more cucumbers and I'm in! Anything I can do to enjoy them, I'm in too. I'm a cucumber fanatic! I love doing cukes like this -- they're really like very mild pickles. I am glad someone is a cucumber fanatic, because it's clearly not me. Beet greens, on the other hand . . . The whole family likes pickles--it's our common burger topping. I actually planted cucumbers this year and it's the one plant that is thriving, where the squirrels aren't interested. Hooray. I've been eating them dipped in hummus, or as a cold salad with feta and some balsamic, maybe a little avocado. I don't suppose cucumbers are things you could really freeze. You could freeze cucumbers no problem. It's the thawing that would get ya. Unless you wanted cucumber soup or a cucumber smoothie . . . I need to make these as we also have a thriving plant! Good for you and your garden!